Nick Brookes follows through on a forehand. The freshman was one of two victors Thursday. 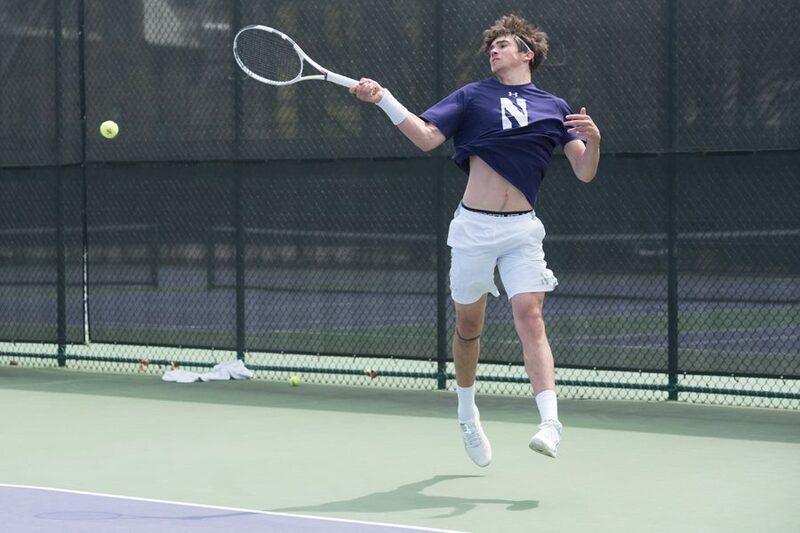 This past Thursday, Northwestern suffered a tough defeat against Iowa at the Big Ten Championships to conclude the season. In Iowa City at their first and final postseason match of the year, the Wildcats (9-17, 4-7 Big Ten) lost 4-2 to the Hawkeyes (16-15, 4-7). NU lost to Iowa earlier this year, with that match ending with a score of 4-1. The one victory in that early April contest came from Dominik Stary, a sophomore who was named an All-Big Ten honoree on Thursday for the second consecutive season. Stary, who is the team’s No. 1 seed, beat Iowa’s Piotr Smietana earlier in the season. Smietana lost his match Thursday to freshman Nick Brookes in the No. 2 match up for singles. Brookes said the rest of this quarter and the summer are all about putting solid building blocks into place for the upcoming year. Brookes’ victory Thursday capped his season off with a team-high 11 matches in the win column for dual competition. The sole other victory against Iowa came from junior Ben Vandixhorn, despite NU winning the first set in five of the six singles matches. Vandixhorn is in his first year playing in a top-three spot in the lineup. He defeated the Hawkeyes’ Joe Tyler 6-4 6-2, whom he lost to in straight sets earlier this year. Vandixhorn had previously told The Daily he was aiming for revenge and said after Thursday’s match that the victory is a confidence booster. He added that it was nice to end the season on a positive note. Iowa faced Ohio State on Friday and lost 4-0 to the Buckeyes. Ohio State went on to win its third consecutive conference championship. Every member of the Cats will return next season, with two highly-anticipated recruits — Simen Bratholm of Norway and Trice Pickens — joining the team. Coach Arvid Swan explained how the match against the Hawkeyes helped NU end on a good mark. Also mentioning last week’s tough loss to Wisconsin, he said the last two matches were “outstanding” regarding team effort.